Messy Church USA is a newly formed nonprofit 501c3 corporation. Messy Church USA has been formed to provide an organizational structure to support the health, growth and sustainability of local Messy Churches in the USA. 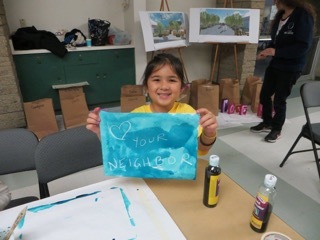 In addition, Messy Church USA will assist individual Messy Churches to become an integrated part of the larger national and global network of Messy Churches. Messy Church USA is affiliated with the international Messy Church movement, whose home is with the Bible Reading Fellowship (BRF), a Christian charity based in Oxfordshire, UK. You can read more about BRF here. Messy Church started in an Anglican church near Portsmouth, UK, in 2004 and has grown into an international movement operating across a wide range of Christian denominations and traditions. It became part of The Bible Reading Fellowship (BRF) in 2006 with the publication of the first Messy Church book by founder Lucy Moore. For more information about how Messy Church began, click here. As an affiliate of the international Messy Church movement, a guiding principle for Messy Church USA is that a local Messy Church is not a stepping stone into an existing congregation, nor is it a church plant, but it is a congregation in its own right. Messy Church is ecumenical and seeks to work with all Christian churches. Christ-centered: Messy Church is a church, not a craft club that helps people to encounter and enter into a transforming relationship with Jesus. Messy Church believes with the historic churches, in one God who is Creator, Redeemer and Sustainer (or in traditional language, Father, Son and Holy Spirit). All-age: Messy Church is for adults and children to enjoy together. Every element should be relevant and accessible to all ages. Creativity: Messy Church uses hands-on activities to explore Bible stories, to reflect a God of creativity and to give people a chance to play together. Celebration: Messy Church reflects a God of joy who wants all of God’s people to have life in all its fullness. Hospitality*: Messy Church reflects a God of unconditional love and is a church for people outside of a traditional church, providing an oasis of welcome and a safe place in which to thrive. Messy Church is about hospitality, expressed most evidently by eating together- whether it’s a plate of sandwiches to share, a full course meal or pizza. *Each Messy Church must adhere to the health and safety and safeguarding laws and guidelines applicable within its jurisdiction and operation and have established health, safety, and safeguarding policies in place that it can provide upon request. Messy Church USA and BRF cannot be held responsible for any matters related to health, safety or safeguarding in respect of any Messy Church. To plan future regional and national conferences in the USA.